I’m super excited to be among an amazing cast at the Unique Photo Camera show December 11-13. And more! Hope to see you there!! Make sure you stop by on Saturday to say hello or take a great class from one of these amazing photogs. Just a quick note to say Happy Thanksgiving! Be safe, gorge on turkey and pie, and enjoy the day with family. Bob, Kate, Ryan, and Julia. And good luck to those of you running the Manchester, CT Road Race! Last Sunday I ran a lighting workshop at Photo Connections in CT. 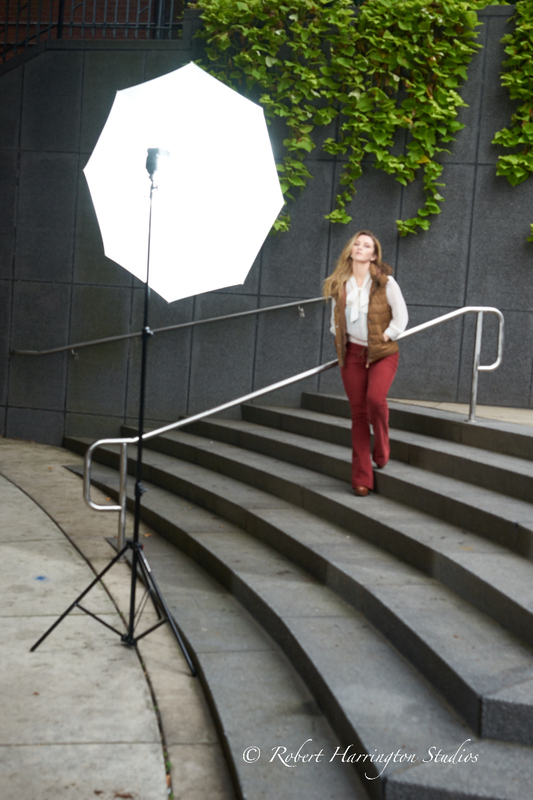 This was a dual light event: one station was speed lights and the other station was Westcott Spiderlite TD5’s. They didn’t have the TD6’s, so we had 5’s. Well, I have to say the Westcott Spiderlites stole the show for me. I’ve shot home made constant lights but not anything ever like the TD series lights. The light out them in incredible, soft, and so pleasing to the eye and skin that they are worth the investment. Here are some sample, straight-out-of-the-camera proof images and BTS shots. These are all proof images. Maddy’s skin looks fabulous under such soft light. I love these lights. If I were to get them, I’d get a few TD6’s and be off and running with beautiful light. That’s it for now. Till next time, Happy Thanksgiving!! Photo Connections Workshop this Weekend! This workshop is coming up quickly, so register to join in the fun soon. On November 22, I’m heading to Photo Connections of Colchester, CT to run a speed light/constant light workshop. Mike and Jeannette from Photo Connections have had me in before, and I’m looking forward to going back for a fun and creative lighting workshop. This is a 3 1/2 hour workshop with a small break in the middle. I became enamored with the Schmidli backgrounds when I met Marco Schmidli at Photokina last year. Marco’s booth was a few down from Expoimaging’s and we had met and chatted for a few minutes at the Expo booth. I walked to his booth and thought he was a photographer, but instead I was greeted by a selection of the most beautiful backgrounds I had ever seen! If you’ve never heard of Schmidli or Oliphant, then check them out. These are not your average everyday backgrounds from Denny, Backdrop Outlet, or anyone else: these are custom painted canvas backgrounds that grace the likes of upscale, high end clients. Macy’s. Ralph Lauren, Vogue, Vanity Fair, Glamour, Mario Testino, Anni Liebowitz and many, many others. Be forewarned, it will cost you a few hundred bucks and at least a full day or even two to do this and also be prepared for mistakes! I tried to paint my own last year. It came out ok, but I made some mistakes that made the background a bit too bright not quite the look I wanted. The third thing is the canvas. While Cotton Duck is ok, Linen Canvas is preferred. Lastly, go dark. I mean go dark on final color. It is easier to lighten a dark background than darken a bright one. I’m going to try this again when the weather gets better of if I can find a large studio/garage space in which to work as it is time consuming and takes a lot of room. Locally in CT: Hull’s Art Supply in New Haven has just about everything except Linen Canvas. They have 8′ wide Cotton Duck canvas, which will work fine after you gesso it. For Linen Canvas, try Rose Brand out of NJ. They can offer 10′ wide canvas, and they’ll mount and ship a canvas on a tube already set up for you. I’m very excited to have found this tutorial as the backgrounds have such a unique texture that they are just beautiful!! That’s it for today. Till next time, happy painting! On November 24 I’ll be headed back to BH Photo Event Space to run a Cosplay location shoot. This shoot was scheduled for October, before Halloween, but schedules dictated we push it to November. Hopefully it won’t be too cold for outside! We’ll shoot a Cosplay model on location near BH. I’m currently thinking the corner of 10th and 30th, under the elevated High Line, where we can add the structure of the el to our images. Cosplay is fun look! With our model/s dressed in costume, we’ll add the city to the photos for some great looks. Come join in the fun and shoot on location. Till then, happy Cosplay! I don’t normally post twice in one day, but the link for this event just came through. I’m getting back into the workshop series and am trying to book as much as possible for the end of the year and start the new year off with a schedule. 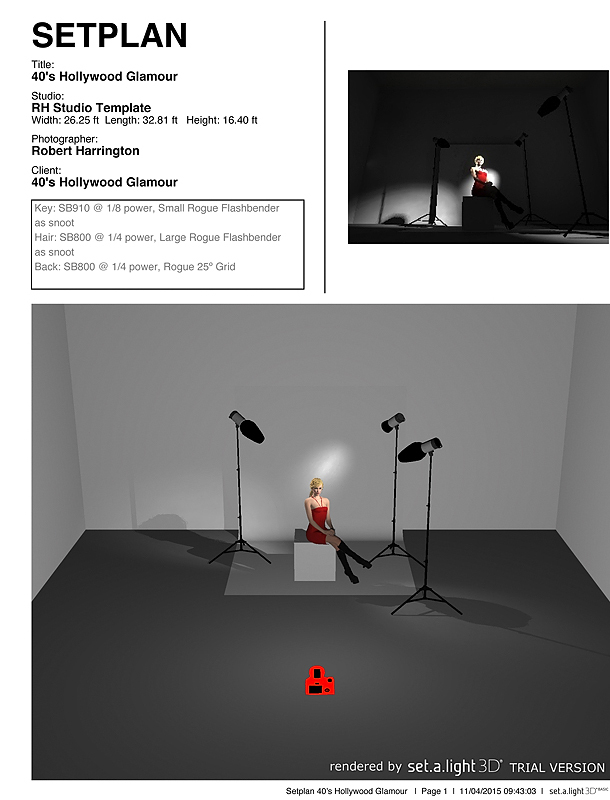 We’ll do other looks, but basically the Hollywood Glamour and lighting for fashion and portraits. Join in the fun before the holidays and get your gift list started after using cool gear! That’s it for today. Till next time, happy shooting! While going through some old files, I came across a portfolio shoot I did a few years back and thought way a great way to end the week than to have a post on using speed lights outside. I liked but didn’t love the shot, so I added a speed light and shoot through umbrella for to add light on my subject but try and not overpower her in the natural light. Notice how much better the image is with just a small key on the subject. 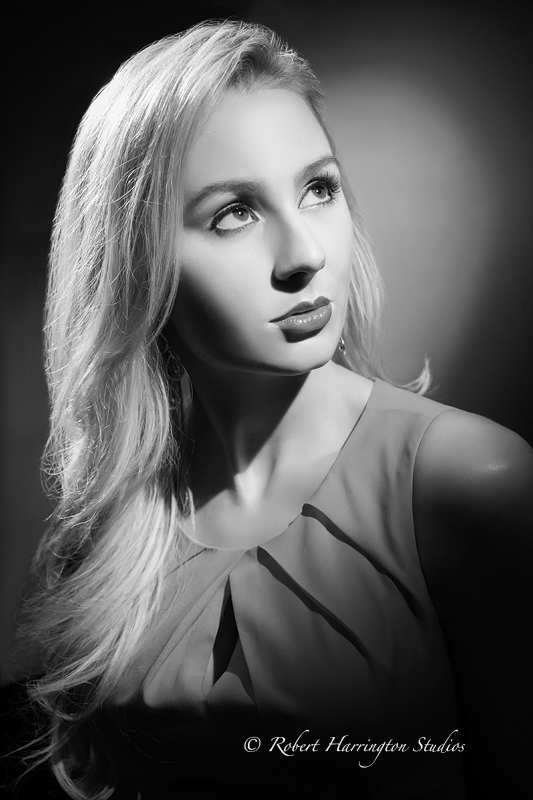 I used a single speed light with a Photoflex 45″ shoot through umbrella for this shot. Both of the above shots are proofs out of the camera, no retouching. Below is my BTS shot. This was one of the rare occasions that I remembered to shoot the BTS! Notice how simple my setup is to get the shot. Not to be outdone and wanting to use my new Set-A-Light software, if I forgot the BTS shot, I can build one in only a few minutes using Set-A-Light. The background is pretty cool, and even though it doesn’t match what was in real life, it is a good way to produce a setup or BTS shot simply and easily in software. Shooting speedlghts, especially with umbrellas, is a fast and easy way to add light to your scene and also learn lighting when in the studio or on location as the setup doesn’t require much work at all. That’s it for now. Till next time, get outside and shoot! I try to include Behind-the-Scenes or BTS shots in my work, especially when teaching. Unfortunately, though, what happens is that the shot is not clear or there is too much background to give a clear image as to the setup. I’ve just found a software solution called Set A Light by Elixxier. This software allows you to build a set in 3D and then export it to a PDF for email, printing, assistants, or any creative who needs it. I just got a free trial and love it. I can build a set and then export it so I can teach with it. I can also add notes and exposure information on the top. In order to get this shot, I built a diagram in Set A Light. In the upper left is my photog/client info and below that is my gear and settings info. This is a great tool! Now I can print out or have simple light plans for every need. The software platform is simple and setup with a series of 2 minute videos to walk you though it. I found that I was able to navigate it in about 15 minutes. This is an amazing choice, and it even includes reflectors that match my California Sunbounce gear. Simply choose your tool, drag and drop it into the set, and manipulate it to any setting you want. Once the set is rendered, simply add a title and exposure information to the upper left hand corner fields and click ok. The PDF goes to any folder or your desktop and prints or emails perfectly. 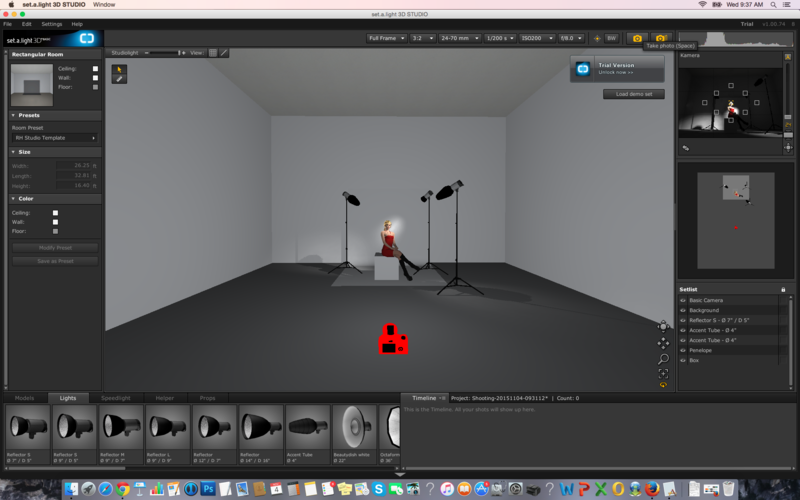 For me, the set maker software allows me to explain lighting setups easily. 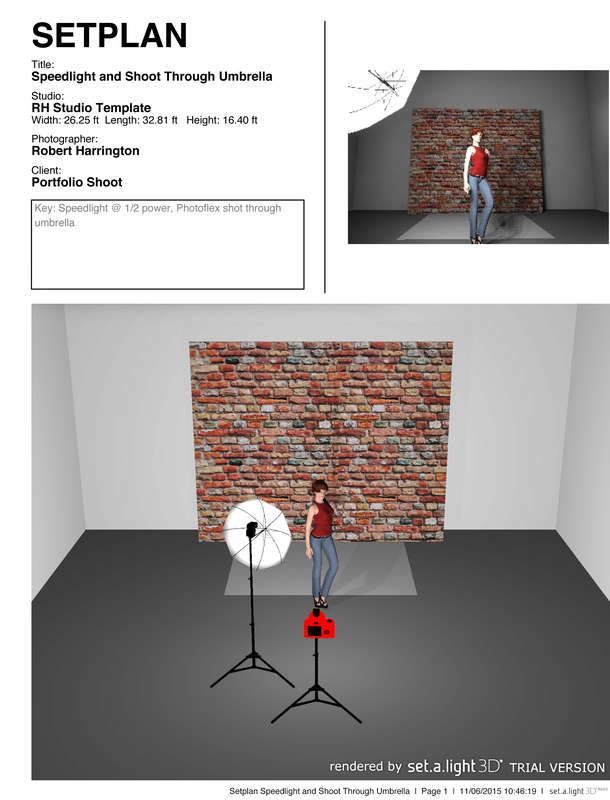 If you are in a studio, simply export to a PDF and give it to any assistants or creatives that need it. You can have a set built and ready while your clients are in styling or creative meetings. This is a great new tool, and at $40.00 US, a steal! 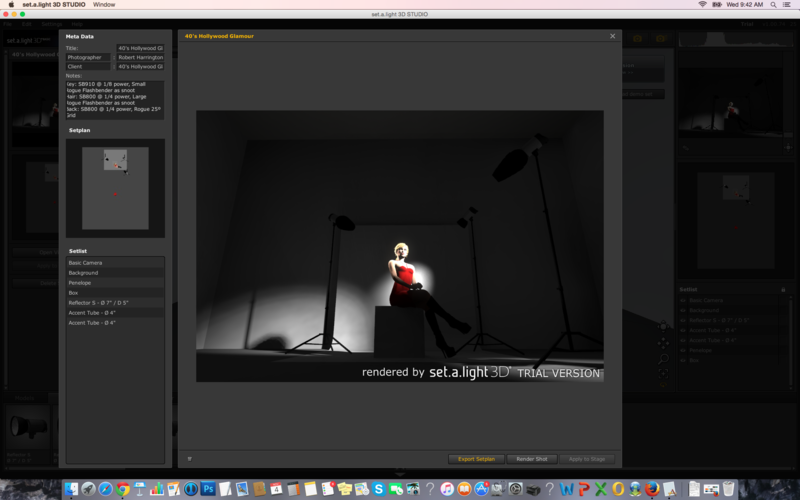 No need to worry about BTS shots anymore, just take a few minutes to create a 3D model and away you go! Well that’s it for today. Till next time, happy set building!